Call us pathetic, but when Shazam took the Spotify shortcut out of its app earlier this year, we wept a little. But Shazam promised that the feature would return down the line, and sure enough it's made a comeback on both the Android and iOS apps. You'll just need to do an update, and from that moment, whenever you 'Shazam' a track, you'll be able to click the play dropdown button and select "Listen in Spotify". Spotify will then open up and play the track, assuming it's in the library. 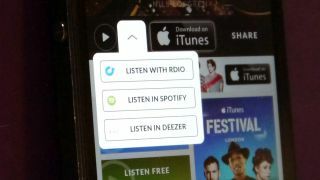 Shazam Chief Product OfficerDaniel Danker recently told TechRadar that the original Spotify shortcut disappeared because it was meant for promotional purposes. "We work with streaming partners who are paying for promotional space in the app," he said. "As a result of those agreements, what we thought of as promotional space actually was being used as functionality by users, and they were less keen to have that functionality go away."